By Hazel Chua on 08/16/12 • Leave a comment! A Batman fan who probably has a wealth that’s comparable to that of Bruce Wayne’s is splurging on a new home theater system–and it’s pretty bat-terrific. To enjoy a digitally projected movie at 4K resolutions you have to visit your local cinem’o’plex and deal with hoodrats, sticky floors and annoying commercials before the feature. That is until Sony unleashes their new VPL-VW1000ES 4K digital projector which is specifically designed for home theater use. That’s right, 4K at home, perfect for all of that 4K content none of us have. So the VPL-VW1000ES of course does its own internal upressing of your SD and HD video so it looks slightly fuzzy but overly sharpened. While the $3,699.99 price tag is a bit high for your average not best home theater projector, it’s not unreasonable if you consider yourself a true aficionado. Or, if you’re completely obsessed with 2001: A Space Odyssey and have always wanted an unblinking HAL-like electronic eye watching your every move. 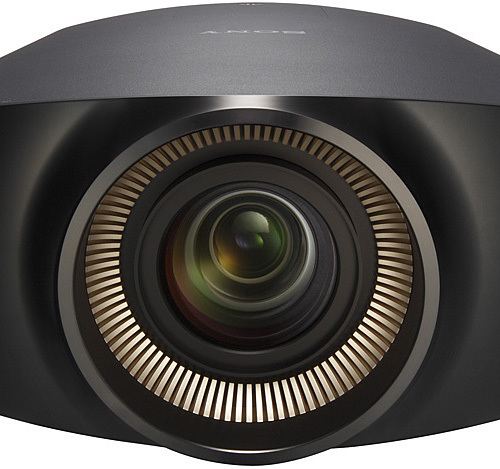 *Update: The $3,699.99 price tag is actually for Sony’s VPL-HW30AES 3D projector introduced earlier this Summer. The price tag for the 4K VPL-VW1000ES has yet to be officially announced. Can We Interest You In A $60,000+ Bed? The components that make this ‘luxurious’ HiCan bed so unique can easily be assembled for far less than its $60,000+ (EUR 42,000) price tag. But why go to all that trouble when you can just order one for the price of a moderately equipped luxury sedan? After all, you’ll be spending far more of your life in this bed than any car. So it’s easily justifiable. 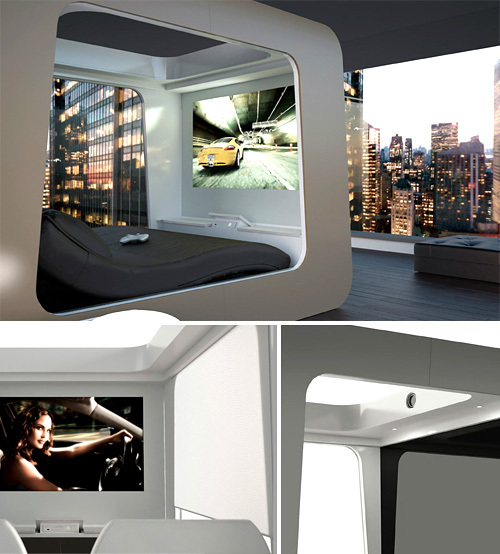 Besides the normal luxuries you’d find on a bed like a mattress and pillows, the HiCan includes retractable privacy blinds, a hi-def video projector that works with a retractable screen at the the foot of the bed, a “state-of-the-art” sound system, a built-in multimedia PC and gaming console and most importantly, a pair of reading lights! (Now I understand why it costs so much.) For the truly lazy and/or bed-ridden the HiCan is also equipped with a home automation system for managing all of its built-in components, including an adjustable bed as well as other appliances or devices in your bedroom. You even get your choice of one of eight different colors when you place an order. The only thing you won’t get is the bed itself, as according to their website they’ve started an “exclusive reservation list.” Which basically means it’s not actually available yet. By Andrew Liszewski on 07/20/11 • Leave a comment! Any and all media filled plastic discs I’ve acquired over the years now sit in a couple of large binders, protected from the dust they’d inevitably collect on a shelf. It’s not that I don’t want to watch them, it’s just that the hassle of hooking up a DVD player to my TV again just isn’t worth the effort. And while ripping them to my PC is certainly an option, it’s just not as easy as Kaleidescape’s M700 appears to be. Sadly, that ease of use also comes with an almost $6,000 price tag. 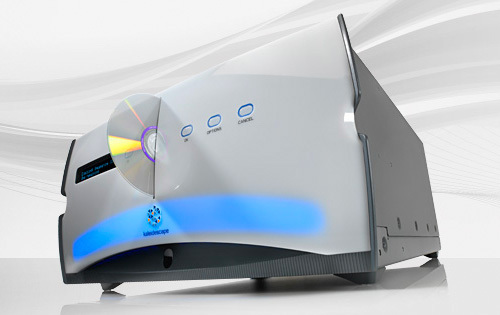 You start with the M700 Disc Vault pictured above, which is capable of housing up to 320 CD, DVD or Blu-ray discs, which will probably be the source of some confusion given the numbers don’t match up. (Calling it the M320 makes more sense to me.) It will then automatically rip, or make a digital copy of the discs, at speeds of up to 15 CDs/hour, 3 DVDs/hour or 2 Blu-ray discs/hour. From what I can tell the M700 comes with its own on-board storage for the ripped copies, which can all be played with the discs removed, except for heavily protected Blu-rays which require the media to physically remain inside the vault. But if that’s not enough to house your entire disc collection, the company also sells a rackmount 1U Server which expand the M700’s storage capabilities to 150 Blu-ray discs, or 900 DVDs. The M700 by itself comes with a price tag of $5,995, while the addition of the 1U Server brings the total cost up to around $16,000. And from what I can tell that’s just the tip of the iceberg when it comes to Kaleidescape’s complete offerings. *Update: It turns out the M700 doesn’t include any storage of its own, but requires one of the Kaleidescape servers to store the digital copies of your media. While I don’t subscribe to it, I can understand that not everyone is happy with their home looking like NASA’s mission control. But sometimes you can’t easily hide a piece of electronics without compromising its functionality. So in those cases you need to employ the age old art of camouflage, like profesional prop builder Richard Grant has done with this large floor speaker that looks like a fine Italian sculpture. There’s no photos of it, but behind the dead stare of this bearded chap you’ll find the speaker’s cones, which presumably work just as well when they’re pointed away from the room. 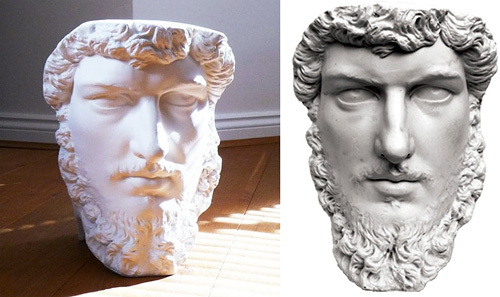 It certainly makes for a lovely piece of art on its own, but I have to wonder if having five of these starting at you in a surround sound setup would be too creepy. Available for purchase soon, though pricing info has not yet been divulged. By Andrew Liszewski on 06/08/11 • Leave a comment! If you’ve bought in to all the motion gaming hoopla from each of the three console camps, the odds are your entertainment center is cluttered with precariously balanced cameras and sensors around your TV. Which actually makes the TriMount organizer seem not so crazy and superfluous. 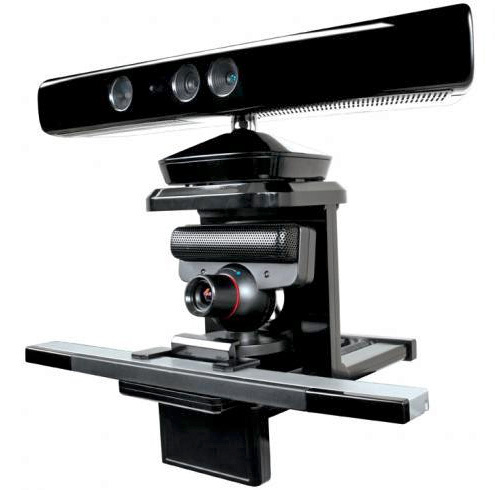 It’s designed to sit atop your flat panel TV and safely hold your Wii Sensor Bar, PlayStation Eye camera and Xbox 360 Kinect sensor, all in perfect unison. 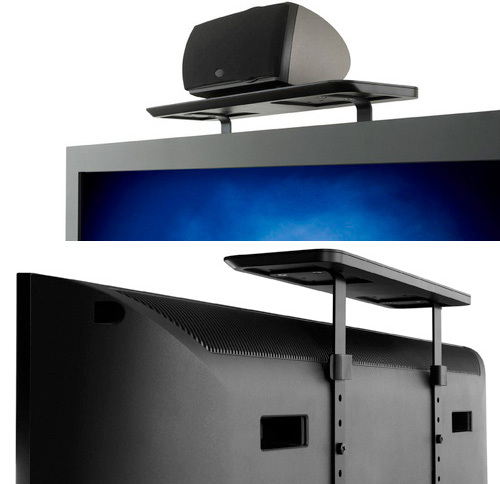 It can be adjusted to safely stay mounted atop your set, or an optional wall mount (not sure if it’s included in the kit) will help your home theater look a bit less overburdened in gaming gear. It will be available sometime around mid-August of this year for just $29.99, with pre-orders already being taken. 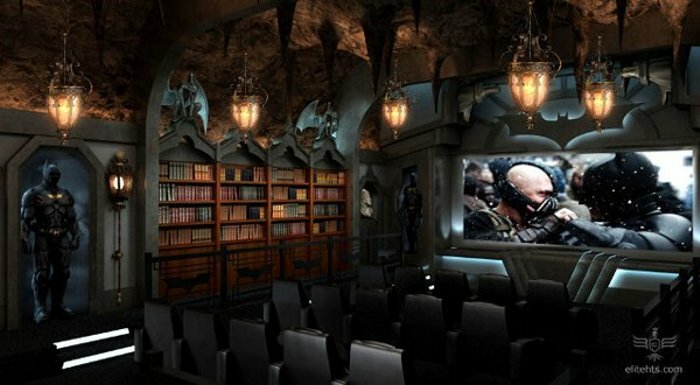 Currently under construction at a home in Palm Beach, Florida, this Pirates themed theater was commissioned by Elite Home Theater Seating with a building and design cost of about $2.5 million. While it’s not officially licensed by Disney or anything, it’s pretty obvious the design aesthetics were inspired by the Pirates of the Caribbean films, and not Cutthroat Island. So what does that much money get you? 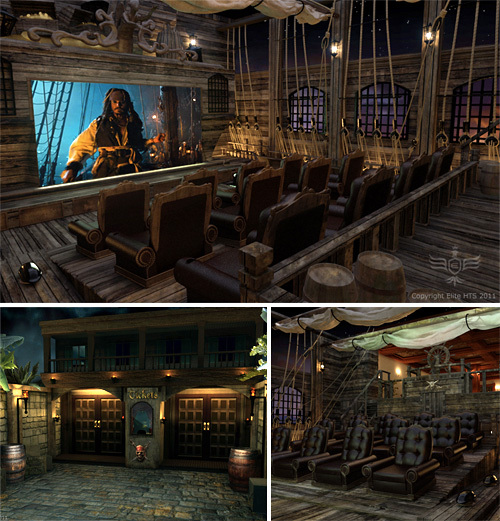 Well everything from an over-the-top entrance complete with ticket booth and a fully-dressed tavern in the lobby that overlooks the pirate ship deck screening room. Too bad it wasn’t completed before the less than stellar 4th Pirates outing though. 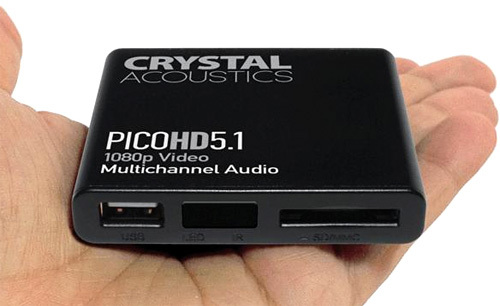 Not only is the PicoHD5.1 media player from Crystal Acoustics remarkably smaller than the 2nd generation Apple TV, but it also runs circles around it in terms of functionality as far as I’m concerned. At least for those of us who aren’t interesting in streaming content. While it might look like a flash card reader, it’s actually designed to connect to a high-def display via HDMI and play back a multitude of different file formats including MKVs and Divx in full 1080P with 5.1 “multichannel” audio. Content can be played directly from an SD card, a flash drive or even a full NTFS formatted external hard drive connected to the USB port. Understandably the PicoHD5.1 doesn’t have any on-board storage of its own, so you’ll have to remember to factor that in to the ~$80 price tag if for some reason you don’t already have a pile of drives lying around. But if you do and are looking for a dead easy way to watch ‘internet acquired’ content on your big screen, I can’t think of an easier or cheaper solution. Life’s all about compromises. You may save a lot of space in your living room by upgrading that massive CRT television to an LCD or plasma, but you soon realize that at least you could use that relic of technology as another shelf. Thin might be in when it comes to TVs, but try putting anything larger than the Wii’s sensor bar on top of a flat-screen and you’ll soon realize you’ve bought more than you bargained for. But the ScreenDeck from Able Bay promises to give you back what you’ve lost, and have your cake and eat it too. It’s nothing more than a shelf designed to mount to the existing VESA screw holes on the back of your flat-screen TV, assuming they’re not already being used to hold it to a wall, that’s perfect for holding accessories like media players, gaming sensors, antennas and probably the most common use, center channel speakers. At $39.99 available from Amazon at some point, it’s not terribly expensive either.